What has three colours of flashing lights and travels up to 80 kilometres an hour on B.C. highways while simultaneously gathering more than 10,000 measurements per second? 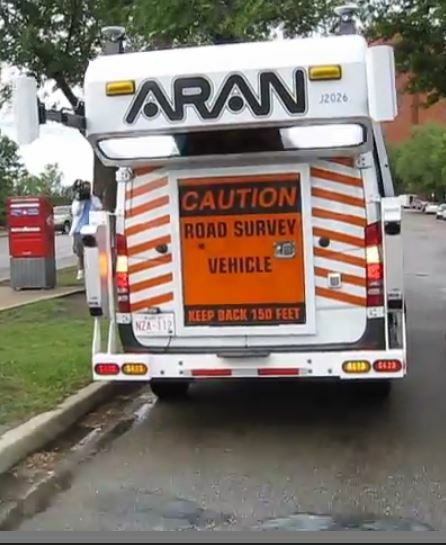 It’s ARAN – the Automatic Road Analyzer! And if you were in Northern B.C. this summer there’s a remote chance you may have spotted this unusual vehicle, logging about 6,500 kilometres of road. The Ministry of Transportation and Infrastructure hires this super specialized van (and the people who operate it and the equipment) to gather information about the condition of provincial highways and roads. The vehicle is kitted out with loads of technology, like laser reflectometers, computers, accelerometers, GPS, inertial navigation system, and high-definition cameras. 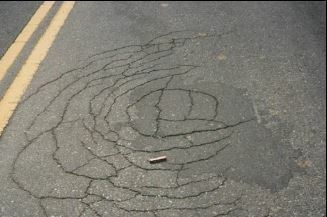 It collects information about road smoothness, rutting (grooves in the pavement from vehicle tires) and cracks (which fall into six categories – pun intended). In addition to closeups of the road underneath, the vehicle also takes photos of the road ahead, which are stitched together to make a photolog. The information obtained by the ARAN is hugely useful to us for gauging the condition of roads, so we can compare it with past data, analyze trends and forecast the best time for a route to be repaved or repaired. We enter the ARAN information into our pavement management system and use our Pavement Surface Condition Rating Manual to help us prioritize and plan for road repairs. When you’ve got about 27,000 kilometres of pavement to stay on top off in the province, the ARAN’s contribution is invaluable. Alligator cracking – one of six types of cracking captured by the ARAN. Take a look at this beauty in action, as captured in Edmonton. The white strobe light is timed with a camera, to illuminate the ground below the vehicle’s rear, so images of the pavement can be captured. The vehicle with its strobe lights and long camera arms extending from the rear is so out of the ordinary, that ministry offices occasionally get calls from citizens asking if the vehicle emits radioactivity. Children sometimes want to know if the vehicle is a UFO. (We assure them that the flashing light from the made-on-earth ARAN is harmless). If you see this vehicle next summer, you can now tell people all about the ARAN and its contribution to keeping us all moving safely around the province. If it’s so useful, why doesn’t Tran BC BUY an ARAN? Good question. We have a limited time to gather information (dry, summer conditions) which takes about 10 weeks, so if we owned an ARAN, it would be sitting idle for most of the year. 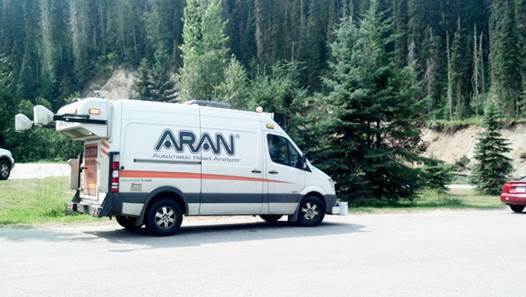 Hiring the ARAN and its specialized operators means we pay only for the equipment and expertise needed at the time, and ensures the vehicle is equipped with the latest technology by the company.